As the commitment to develop next generation of Firefox 4, the Mozilla development team has released the seventh beta of Firefox 4. 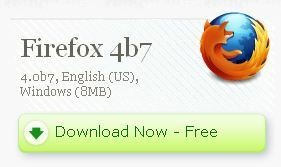 Similar to previous version, the Firefox 4 beta 7 is also based on the Gecko 2.0 Web platform and includes lot of features, enhancements and improvements for desktop users as well as developers. WebGL is enabled by default on Windows and Mac OS X. WebGL support requires an OpenGL-capable graphics card. Support for other graphics cards on Windows (specifically Intel GPUs) and Linux will be coming in a future beta. Certain rendering operations are now hardware-accelerated using Direct3D 9 on Windows XP, Direct3D 10 on Windows Vista and 7 and OpenGL on Mac OS X. Improved web typography using OpenType with support for ligatures, kerning and font variants. HTML5 Forms API makes web based forms easier to implement and validate.